Saturday Morning Slam 05-04-13 - WrestleCrap - The Very Worst of Pro Wrestling! Really, that’s how this show started. Even the announcer didn’t sound excited about this show. Gotta admit, that’s kinda a far cry from the last few weeks where we’ve been promised CHANGES and NEW ERAS and all the jazz, so it’s not like I can say I blame him or anything. The Prime Time Players head down to the ring, playing to the crowd, and doing their little dance. 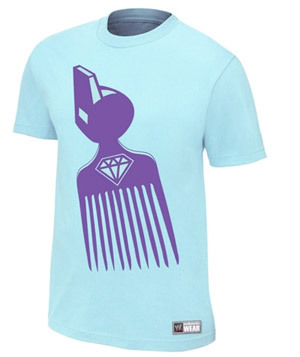 And they are wearing new gear, showcasing WWE’s ability to somehow merge a whistle and a hair pick. Just as I was pondering if I’d ever seen a more obscurely absurd piece of apparel, we get a spin of the Saturday Morning Slam Commentary Wheel of Misfortune and get..
Why does WWE hate me so much for doing this report? I mean, you’d think they’d want to be nice to us, cater to us in some small way. Like not putting the worst commentator in wrestling history on here and making me record the stupidity for generations to come. Vince, throw me a bone here – we likely get more views for our Saturday Morning Slam reports than anyone else on the web. At the rate we’re going, we’ll likely grow to triple digits by year end! So yeah, never ever ever ever again do this. Backstage we go where we learn this match was made earlier this morning due to a confrontation between the Prime Time Players and The Usos. 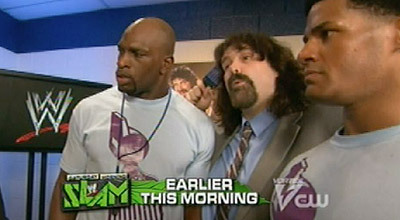 Said confrontation saw The Usos attempting to teach Saturday Morning Slam GM (Garanimal Model) Mick Foley how to dance, which led to the Players attempting to teach Mick how to dance, which led to Mick using the hair pick as he looked into space thoughtfully. Or maybe it was wistfully. Guessing you mean The DEEVER, my little pet name for the lovely Layla El who always mispronounces “Diva”. Yeah, I don’t think that Mick could quite keep up with her. But I too would not object to her being on SMS every week. To the matter at hand, as you’d expect, Mick wants to book a match with Young vs. Jey RIGHT NOW. Sadly, this cannot take place, explains Titus, because the pair are going to a fish fry. Why are we getting this match instead of footage of that?! 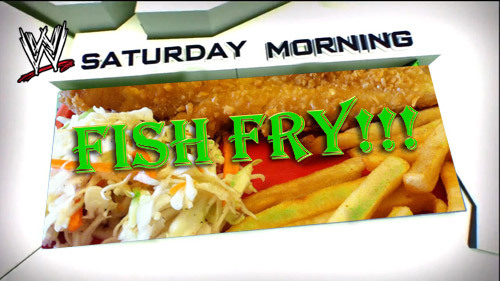 “WWE Saturday Morning Fish Fry” has millions written all over it. But I could totally see shows like this making the air if that goofy network of theirs ever launches. And I guarantee it would be better than this. Unless it has The Mad Ox doing commentary, of course. For instance, this morning Josh tells us that this match could be a challenge for both men since they are used to competing in tag team matches. 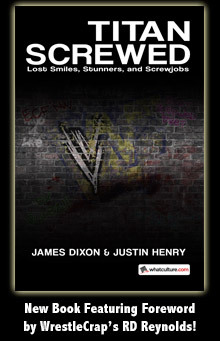 Maddox responds by stating this match could be a challenge for both men since they are used to competing in tag team matches. That’s not a typo. Dude literally repeated what Josh said, almost verbatim. We get about two minutes of stalling and other non-action before Young sits on the apron and pouts. Why? No idea. Maybe he could hear Maddox’s commentary and decided to show his displeasure as well. This leads us to commercial, and when we get back Young makes the age old mistake of ramming a Samoan’s head into the turnbuckle, which is met with the age old response of doing a horrible dance. Remember when Sika and Afa used to do that? Yeah, I don’t either. Which is too bad, really. I remember Harley Race shucking and jiving with Akeem once, and it was grand. A bit more back & forth action follows, and finally Jey takes charge, heading to the top rope. Titus comes over, and gently, and I mean GENTLY, taps him on the arm, which causing the ref to call for a disqualification. Sorry, sorry, I know I promised last week I wouldn’t use emoticons, but the roll your eyes one was staring me in the face. If this entire show consists of nothing but Usos and Prime Time Players I am NOT going to be very pleased. And I can’t imagine Titus will be pleased either – now he’s going to miss that Fish Fry for sure. The new match starts, and we get some dull as dishwater ‘action’, the highlight of which is Titus getting caught in a sunset flip, which he escapes in a most unique way – he literally just walks away. Ok, gotta admit, I’ve been following wrestling for over 25 years, and have NEVER seen that. I can’t decide if it’s clever or just dumb. The fact that I can’t decide makes me think it probably must be dumb. Back on commentary, Brad notes that the Usos are identical twins. “Kinda like ghosts!” he says. At this point Josh just kinda gives up. I’m right there with you, kid. In the ring, Young rolls outside to avoid a kick. He then proceeds to run away and trips over the ring steps in what I believe was a planned spot. Unlike earlier, I CAN decide if that’s clever or dumb. Care to guess which it was? Unless you’re catering to Sean Stasiak’s old CLUMSY GUY gimmick, I don’t know what that was supposed to accomplish. To commercial we go (yes, again) and upon our return we have Mick Foley with a Don’t Try This in which we see exactly ZERO of his moves, wrestling, dance, or otherwise. I am praying that next week we get a Darren Young Don’t Try This wherein the entire 30 seconds are just that animated GIF above playing over and over and over. Talk turns to Josh asking if Brad is scouting the men he in the ring. He says that of course he is, and then notes that Titus “puts the dominant in dominant.” No earthly idea what that could even mean. Don’t want to know. Don’t care if he’s really an idiot or just pretending to be an idiot. Don’t know, don’t care. Just don’t want him on this show any more. Big splash by the Usos finish it. So they go 2-0 this week, first time they’ve won back to back matches since, well, ever I gotta think. So THAT’s how you guys all made it through this week. Rest assured, the next time I see Maddox on here, the skim milk is going back in the fridge, and the Captain (Morgan, that is, not Mike) will set sail! 18 Responses to "Saturday Morning Slam 05-04-13"
Yes brad maddox is bad he ruin nxt too interrupting william regal. Plus talking over a great diva match between paige and summer rae.He need to be fired. Notice how the show switches between good and bad every other week? So at least you have next week to look forward to now! 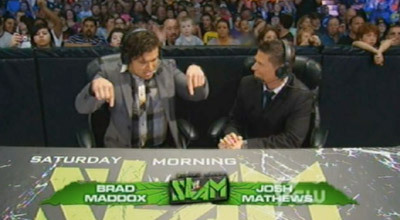 The one think I noticed more than anything else on this week’s show was that every time the camera cut to the announcers during a head shot in the ring, Brad Maddox would always be looking down at the monitor INTENTLY watching the match and never once made the typical over the top reaction to the blow that Josh Mathews and the other guest announcers make to cover for the cutaway. If Maddox is intentionally acting like an idiot as part of the show, then he is REALLY living his gimmick. Cmon Vince if you do a horrible Saturday morning slam the least you could do is have Daniel Bryan and his bear talk on commentary to even the show out and make it at least tolerable. I can’t stop laughing at Titus just walking away to counter the sunet flip. That’s something I can see Colt Cabana doing. BTW, I”ve seen Rikishi do the dance after being rammed into the turnbuckle. Honestly, this whole week, Monday through Saturday, was a giant stinker in the world of wrestling. Well, when you think “Giant Stinker”, you think “WrestleCrap”! I knew you were going to eviscerate this week’s episode when I saw Mad Ox. However, he can’t be the worst commentator in wrestling history. That has to go to either Tony Dawson or Randy Rosenbloom. My vote for worst commentator in wrestling history would have to be Juventud Guerrera on the dying days of Thunder. You needed subtitles to understand the man (which XPW thoughtfully provided when they gave him his own interview show, the Juice Bar). On the plus side, I would take Stevie Ray on commentary over Brad Maddox. Actually, a Stevie Ray/Maddox commentary team might be perversely entertaining. Maddox is definitely not the worst. Steve The Turtle Weiner is the worst wrestling commentator who has ever and will ever live. Seriously, he spent an entire match at the last King of Trios just playing with a rubber chicken rather than calling the match. Coming soon – The Vince McMahon and Hulk Hogan interview about Paul Orndorff — starring Forest George as Hulk Hogan, and R.D. Reynolds as Vince McMahon. Okay, maybe not. PTP have a ton of talent and charisma, but they’ve been in freefall ever since AW got fired last August. Hard to believe they were once in line to be the Tag Team Champs. What’s next, the PTP catchphrase getting reduced from “Millions of dollars, millions of dollars!” to “Hundreds of dollars, hundreds of dollars”? Putting the dominant in dominant. Is that kinda like taking the leg out of your…leg? It’s such a shame, because when Maddox first started getting air time, I was actually liking the kid.